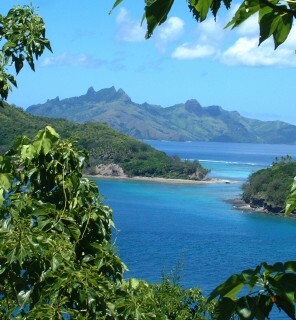 Landscape: The north-western most islands of Fiji. 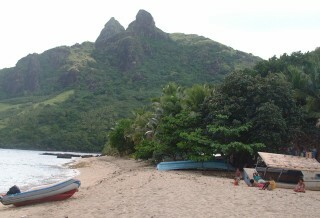 About 20 tall, volcanic islands covered in palms and native shrubs, surrounded by reefs. Sailing north from Navadra, we entered the island group known as the Yasawas, which are governed by a new set of chiefs and one high chief. Less accessible than the Mamanucas, the Yasawas still host many tourists, but mostly backpackers: young Kiwis, Aussies, and Europeans who ride the Yasawa Flyer power-catamaran from island to island, staying at backpacker resorts which offer small bures or tent sites for the guests. No pools, no tennis courts, these are resorts where the guests make the fun: diving, snorkeling, dancing and singing until late at night. We joined in some of the resort activities, but mainly enjoyed the Yasawas for the village visits, the people we met, and the wonderful walks in the hills and along the beaches. Beautiful Waya Island is the southern-most island in the Yasawas. 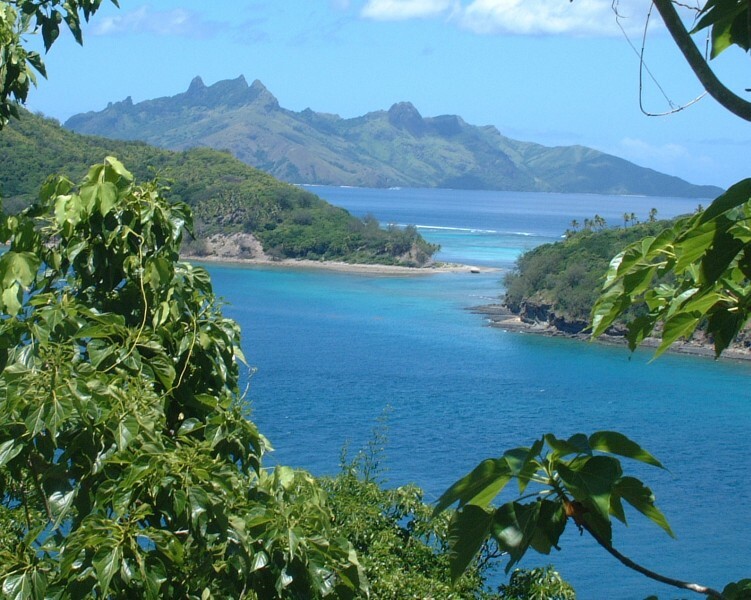 It is also the largest and highest island, reminiscent of the Marquesas islands of French Polynesia with its volcanic plug spires. We anchored in the large, north-facing bay and when the tide allowed, took the dinghy ashore and pulled it up on the beach under coconut palms next to the local fishing craft. A Fijian came to meet us, and we told him we would like to do sevu-sevu with the chief. He led us, barefoot, along sandy village paths, past thatched huts where women sat on mats cooking or minding young children. The chief bade us sit on a shaded mat with him, outside a concrete house. We placed the bundle of dried kava root (we had brought it from the market in Suva) and he said many Fijian words to it and to us. At the end the first man who had led us there interpreted, saying "The chief accepts this sevu-sevu and you are welcome in the village. You may swim, snorkel, talk with the people, take pictures, whatever you wish." With many "vinakas" (thank yous) we left the chief. We walked the sandy paths of the village, between thatched homes and swept areas where the village women sat on mats cooking on open fires or clay hearths. Chickens ran about everywhere. Laundry was strung between the houses and small children ran about. 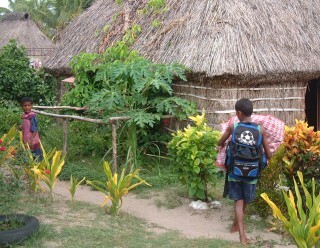 The school-age kids all attend a boarding school on another part of the island. This being a Friday, they'd be home later for the weekend. One couple invited us to sit on their woven pandanus mat under their scrap of blue tarp and have some tea with them. It was served in metal bowls with no milk, but bit of sugar from an old coffee can. The man sat next to us and talked while his wife stayed back by the fire, preparing the evening meal. We were hoping to buy some eggs, but the tiny store was open only at 6 am and 6 pm. Since the tide would be too low then, we tracked down the store keeper. He was happy to open the store, but probably disappointed when we didn't buy anything. The shelves held primarily powdered milk and corned beef and cooking oil. Many of the islanders work at Octopus Resort, a backpacker resort about 15 minutes' walk over a ridge to the west from the village. The resort is probably the main cash income for the villagers. There were several other possible anchorages in the main bay of Waya but we didn't get to them. We did take a hot dry walk up a semi-dry stream bed to a "waterfall". It's probably lovely after heavy rains (which are scarce!). On Nanuya Balavu we anchored off Manta Ray Resort which is a lovely backpackers resort, with beach bures, ablution blocks, and then a steep stair-cased climb to the ridge-top where there is a bar and dining on an open veranda. The views at sunset were stunning, and we told the guests about green flash sunsets. As the sun went down the air filled with hundreds of large fruit bats (calling flying foxes for their size and facial shape). The workers at the resort told us how to get to the nesting sites of the bats, so the next day we followed their directions to the trail that followed the spine of the island. Instead of finding bats we had a lovely hike through scrub forest, palms, and palmetto trees. As we'd sailed up from Waya, Jon had noticed a nice rock outcrop high up on the side of Nanuya Balavu so we started looking for ways to get to it. By following some spur trails we found, we got to a fabulous lookout on a grassy lawn above a cliff, with views across the channels to the south. Our most northern stop was at Nanuya Lailai Island, home of the "famous" Blue Lagoon. We anchored at the northern end of the island, away from the mini-cruise ships that called every few days to disgorge their passengers on the white sand beach. That put us off a narrow strip of sand near the mooring for the island cargo boat and the Yasawa Flyer power cat. Flyer was met daily by long boats from various back-packer resorts, dropping off and picking up guests. 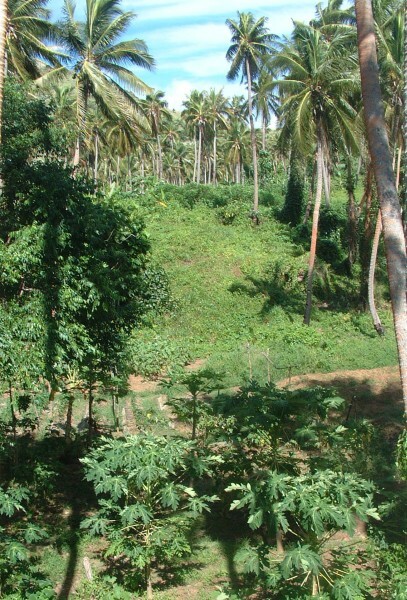 The reefs surrounding the western side of the island were dead and bleached so we walked the green hills behind the upscale Nanuya Resort to the series of backpacker places on the eastern shore. Each had its own style of bure and common room. Some had small playing fields for volleyball or soccer. In the heavy winds, the guests were huddled behind plastic tarps trying to keep the sand out of their tea! We would have liked to swim or explore by dinghy but we were there on days with heavy winds and the water didn't look like much fun. going ashore to do sevusevu. A short dinghy ride to the west of Nanuya Lailai was the larger island of Matacawa Levu where the village of Sese nestled on the shores. 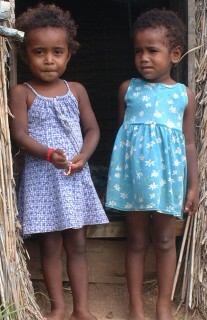 Our niece, Rori, joined us on a visit to the village to present kava in a sevu-sevu ceremony. We were lead to the home of the chief and invited inside. It was a nice concrete house with one huge room filled with carpets, a few pieces of furniture, and many knick-knacks on the walls. We sat on woven pandanus mats and placed our kava root bundle present in front of the chief for sevu-sevu. 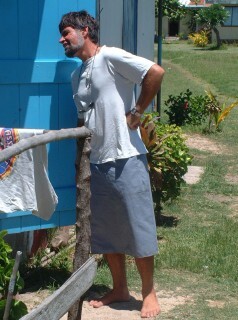 He spoke quietly in Fijian and we caught the words sevu-sevu and vinaka. Through the interpreter he told us we were welcome to walk around the village and beach, to talk to the people and take pictures. He asked a few questions about where we were from, and we learned that there are about 200 people in the village, and that we were invited to church the next day. A local farmer-entrepreneur named Sakay took us in our dinghy to his plantation south of the village. This involved a wet and wild dinghy ride, followed by a much slower trip navigating up a mangrove lined river to the base of his fields. He walked us over the hills and valleys of his plantation where we grows pineapples, papayas, mangoes, coconuts, green peppers, green beans, pumpkin, and bananas. As we looked down on the bay from his house, we discussed his plans to put in a little marina, or at least some moorings for visiting yachts. 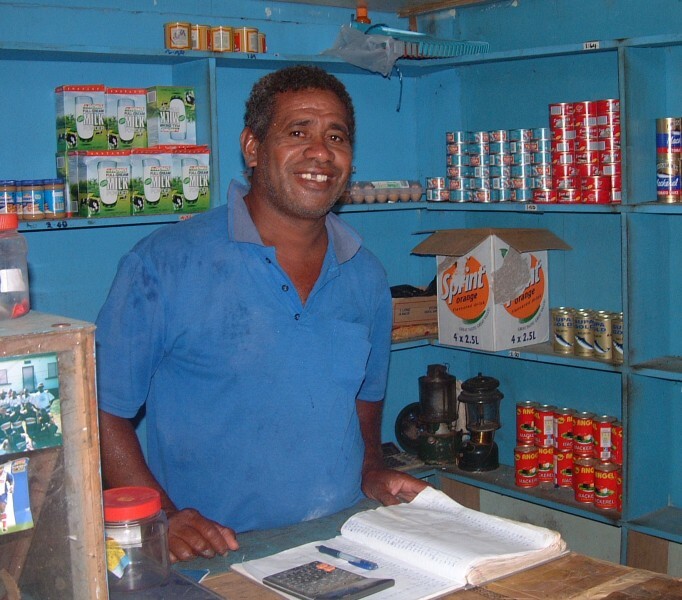 We found this very interesting as most native Fijians have little if any entrepreneurial inclinations. Sakay was obviously the exception to the rule. He even had a VHF radio (and battery and charging system) so yachts could contact him. We bought some fresh fruit, met his nieces, and then had fun digging the dinghy out of the mud. The tide had gone out while we were exploring! 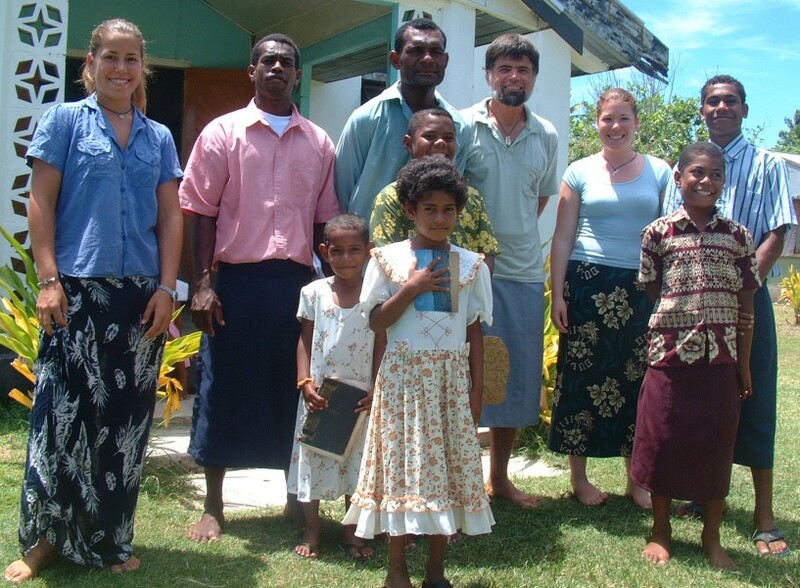 On Sunday we all dressed in our best (Jon in his Fijian pocket-sulu skirt) and attended the Methodist church in the lovely, green-lawned village of Sese. We were led to seats on bare wooden bench-pews, right in front of the choir. There was no breeze, so it was a big relief when one of the parishioners handed us woven fans! Even though we had been seated in front of the huge open windows it was HOT in there. 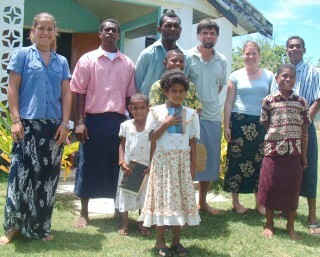 The service was almost all in Fijian, and we tried to follow along in the prayer book. The best part (as usual) was the a capella singing by the choir. The choir leader would hum a note, and then the voices were raised in magnificent, inspirational, multi-harmony song.